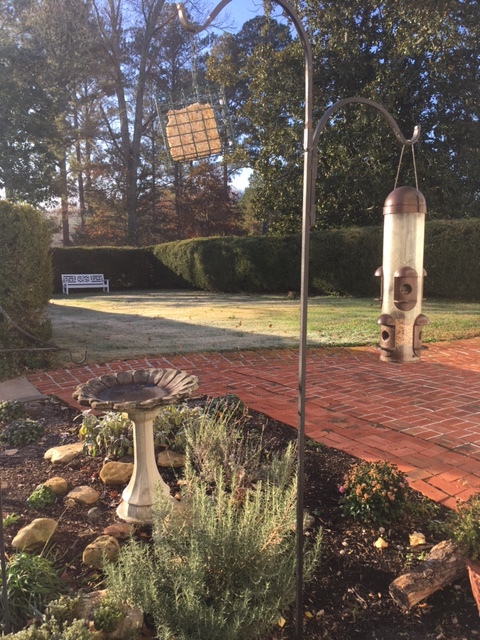 Just like the opossum, I have always had the chickadee as a totem animal. 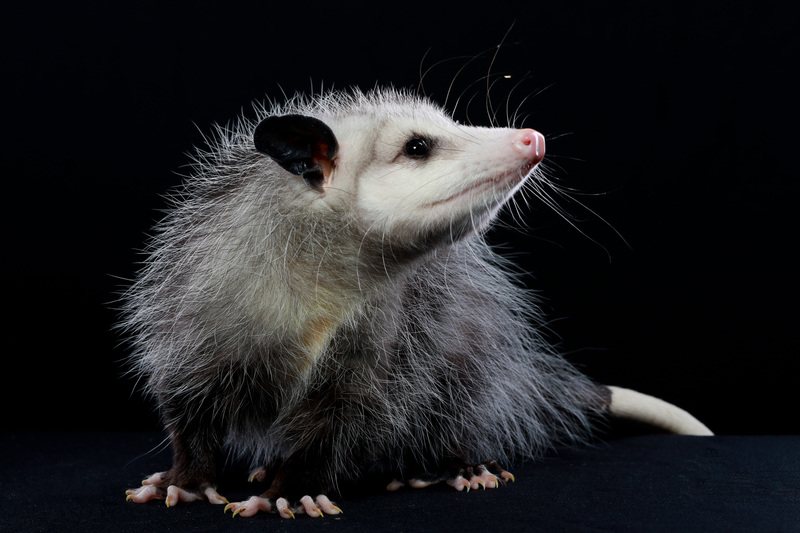 There are so many characteristics of animals that play out in our lives and its common to have more than one totem animal. 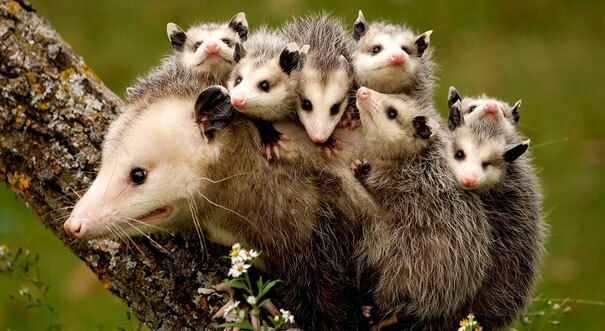 But over the years chickadees and opossums have played a prominent role in the lore of my life. According to Animal-Speak by Ted Andrews, the bible of animal totem information, the black cap of the chickadees indicates the depths of the mysteries of the mind and the search for Truth. There are seven types of chickadees that indicate the alignment with the seven chakras, seven stages of alchemy and ancient mysteries. All of that wrapped up in this charming little bird that demonstrates that Truth doesn’t always have to be hard but sometime comes to bring joy and cheer to life. I’m all for that. The other day I saw a little post on Facebook that brings new meaning to the chickadee totem. 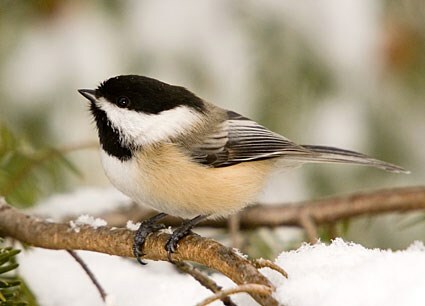 According to Audubon News, chickadees have the remarkable capacity to swap old brain cells for new ones allowing them to keep track of the hundreds of new places they store seeds. Sign me up chickadees! I want some of that. As I head deeper into the second half of life I’m taking on chickadee medicine as I am actively swapping old brain cells for new and building new neuron paths. Remember last year I went to the Joseph Campbell Library in California? Well on that fateful day I picked up a catalog of degrees offered a Pacifica Graduate Institute. One program caught my eye and wouldn’t leave me alone, Depth Psychology: Jungian and Archetypal Studies. I tried to resist with lots of good reasons including a previous vow never to go back to school. But it seemed to be the next step on my pilgrim’s path—the road deep into the infinite universe of the mind and the mysteries of life. I started classes last month and although a challenge, it is a good challenge and with the help of my chickadee pals I’m going to grow some new paths into the mysteries of the mind. Thanks for being my adorable companions on this magical journey. This month marks my 5th blogaversary! When I tentatively pushed that ‘publish’ button that day I had no idea where my pilgrim’s path would take me but it sure wasn’t across a country or to graduate school. But there you have it. Tell the universe “I’ll go” and you never know where you will be headed next but it will be well worth the journey. Iona had been calling me for a long time. This tiny island, the last bit of land before the great Atlantic, is at the end of the earth. Ireland is 40 miles to the south but other than that the only thing west of Iona is the vast unknown. 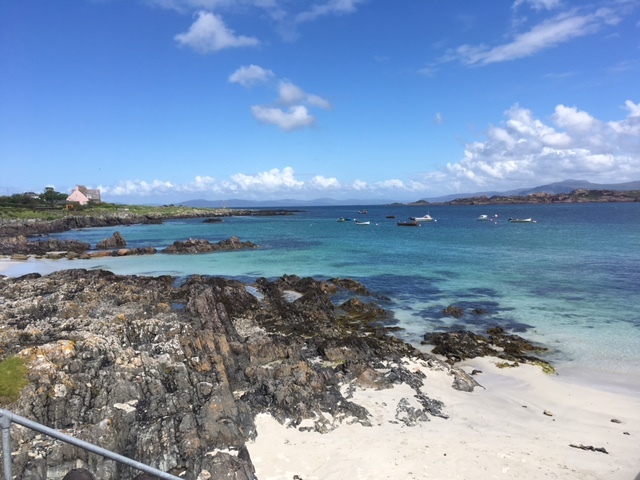 It is serious work to get there: fly to Edinburgh, take a train to Oban, then a ferry to Mull, cross Mull on a one-way road in a bus and then one more ferry ride to Iona, walk to the Abbey and you finally arrived. Why would anyone feel the need to go to such a remote place? Why would this tiny island call me? 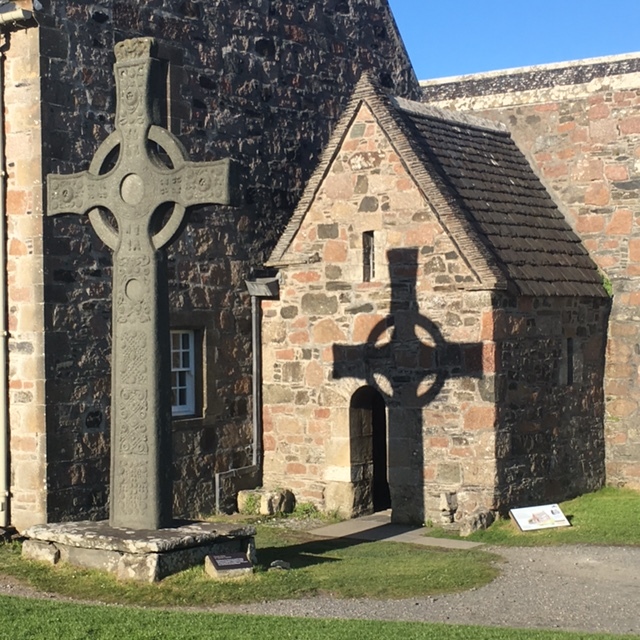 The story goes that St. Columba got in a bit of an argument over the Psalms at his Irish monastery so he was banished to Iona and built a monastery there in 563 and thus credited for bringing Christianity to Scotland. The monastery thrived and the Book of Kells was written on the island. It became a major pilgrimage site and great honor to be buried on the island. The first major Celtic crosses stood in front of the Abbey and the remaining pieces are in the museum. But there is a power to this place that seems otherworldly. It is often said that “the veils are thin” on Iona and it is easier and quicker to reach heaven if buried on the island. Many years ago I read that it is an “Atlantis Priestess Portal”, I can’t remember where I read that but I never forgot that description. 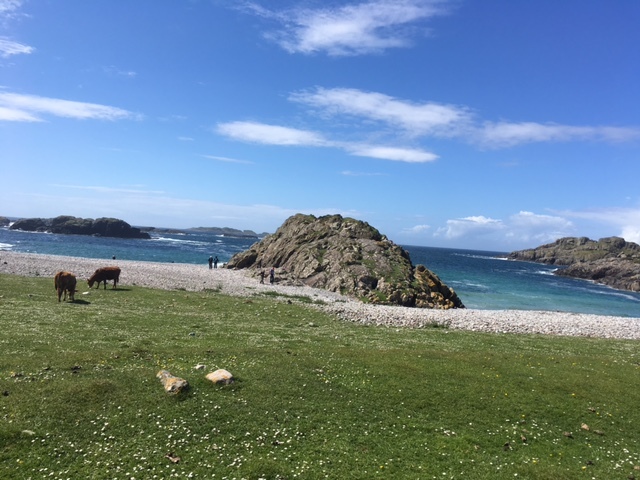 I can’t say for sure what the power is–history, geography, geology, myth– or what this island means to other pilgrims in the past but what I can say is that I had one truly perfect day on earth on Iona. I didn’t go to Iona on my 2009 trip to Scotland, I knew that time wasn’t right. On this trip it was the final destination that all the holy sites on the way prepared me for. It was raining and foggy on the one-way road across Mull and the traffic was very heavy. I couldn’t see the landscape and felt like I was in a cocoon in the very slow moving bus. Every few hundred feet we had to pull over and wait for an oncoming vehicle. We finally arrived at the parking lot and I got my suitcase and walked through the rain down to the ferry and across the waves onto the ramp; no tourist cars are allowed on the island. I got to the hotel and settled in and then had a group tour of the Abbey. It is plain but it is hallowed ground. I visited the museum and took a walk. As I walked the path to the ocean I had the same overwhelming feeling of joy that I had on the Camino. 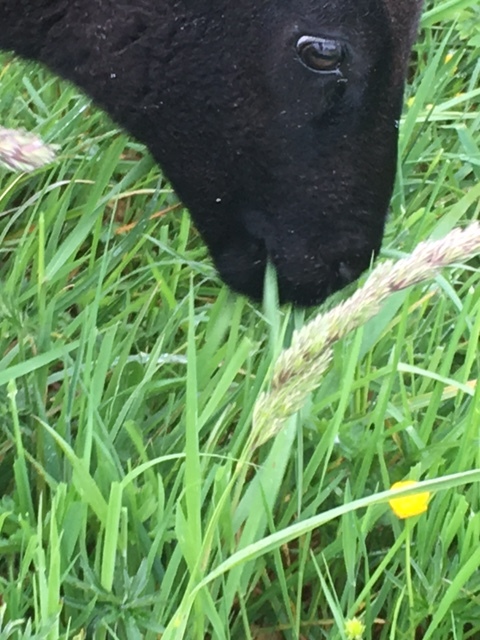 Three black sheep grazing by the road added to my happiness. That first evening after supper, most of the group went to the service in the Abbey. The Iona Community, which is dedicated to social justice, conducted a beautiful ecumenical service with singing and sharing of bread. Coffee and dessert in the hotel lounge with my dear friends ended my first partial day on Iona. All day a song that I had in my iTunes had been going round my head, Cantique de Jean Racine by Faure. The words are in Latin so I looked up the translation, I felt there was a message. “O Christ look with favor upon your faithful people now gathered to praise you”. In my excitement to visit these holy sites and have experiences I forgot the true goal of pilgrimage—-devotion. 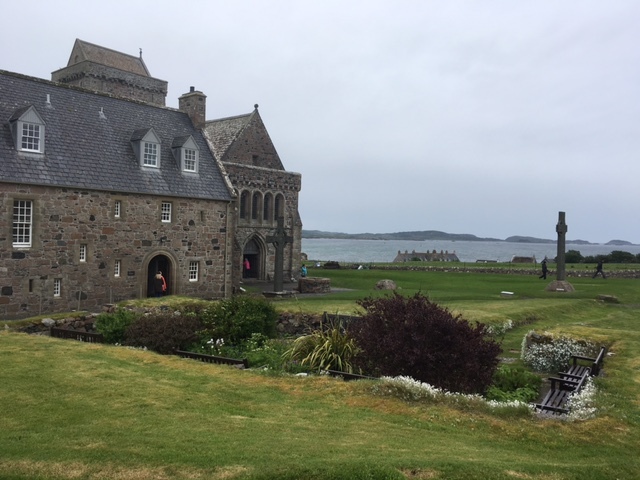 I was on Iona not for my benefit but to give my devotion to the Divine. I was on this holy isle to sing praises and give thanks for life. I listened to the song over and over, soaking in the beautiful melody and important message. I had been watching the weather all week hoping that we would have a sunny day on our full day on the island and my prayers were answered. I woke to bright morning sun and the sound of mooing. 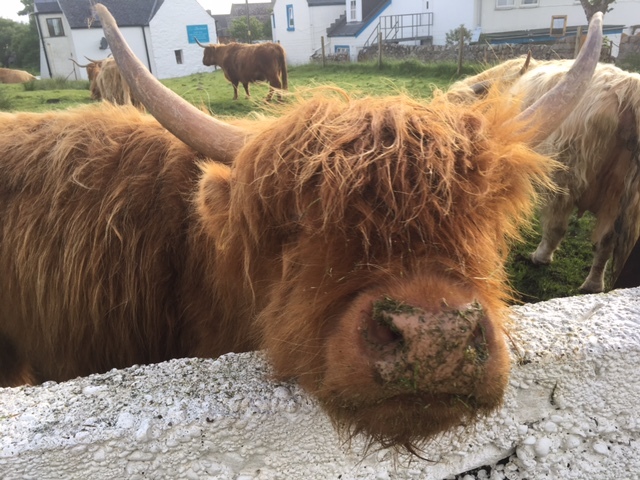 I walked out to find a herd of “hairy coos”–highland cattle in the nearby barnyard. 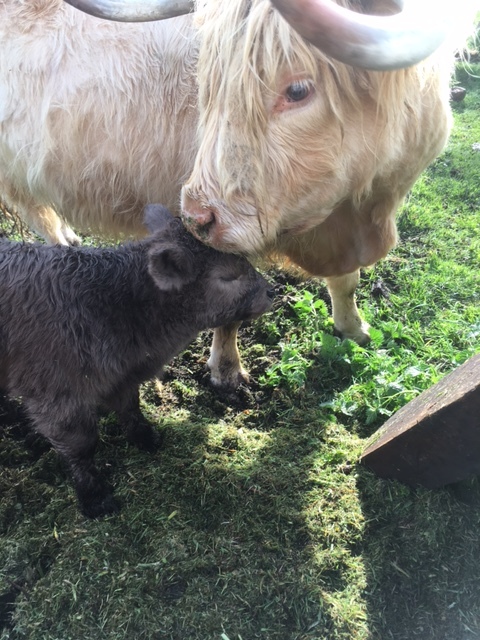 The baby came running to greet me but was kept at bay by a long-horned mother with gruff voice. I promised her I wouldn’t touch, just admire. After breakfast the hikers in the group met at the ruins of the nunnery to walk across the island to St. Columba Bay. We had a few moment to enjoy this place of worship where stones stacked by man and meadows provided by Mother Nature come together to make the perfect chapel. After obtaining a few snacks our little group started the walk. The sparkling sun, green meadows, charming animals and the chatter of dear friends made the world even brighter and more vivid. 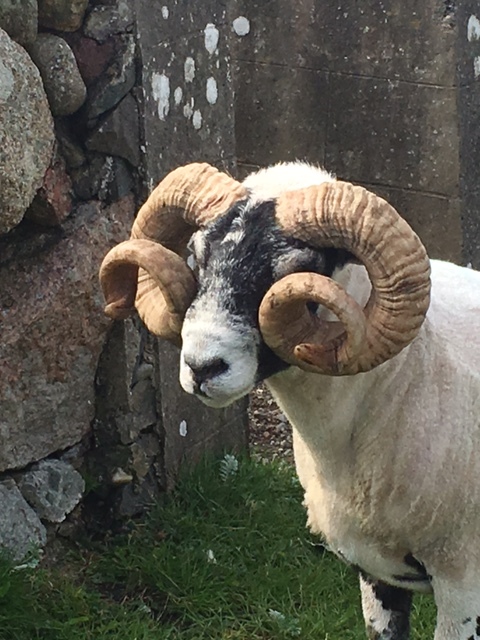 How about the ram with such curly horns that they looked like he had spectacles on. 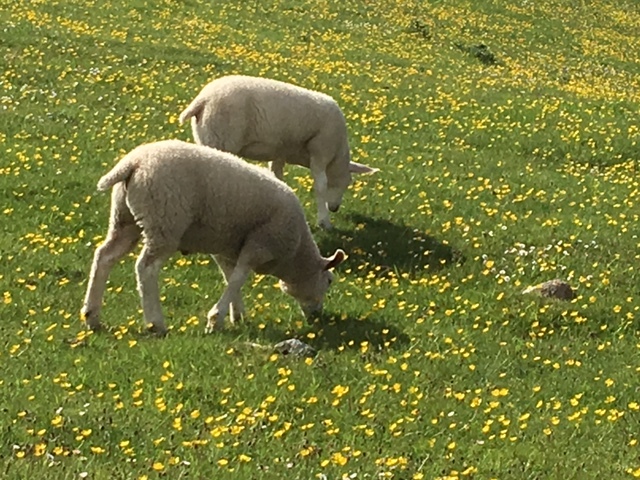 Or my personal favorite, white fluffy lambs frolicking on yellow-flower meadows—ahhhh, it was almost too much to bear. Every step was like walking in a dream. Down the final hill was a beautiful, turquoise bay. The beach is a thick pile of perfectly smooth rocks and down by the water are innumerable green marble stones polished by billions of waves for millions of years. I was surprised we could walk back to the hotel with the weight of all our treasured stones which are said to give protection. I went over to walk the near by labyrinth and had a bit of an encounter with the head cow as we were walking in open pasture. Apparently I was on her path and she told me in no uncertain terms to get the hell out of her way. Big bossy cows not behind a fence are not to be trifled with and I quickly obeyed. Then lunch and a bit of retail therapy—that didn’t take long for there are only a few shops. I decided I needed more time in the Abbey to wander alone. I sat in a stream of sunlight and listened to the theme song of my visit on my iPod and soaked in the glory. It isn’t a fancy Abbey but the history and devotion of 1500 years makes it a powerful place. I sat in front of the stone crosses in the museum and thought about all the pilgrims before me and those to come. After supper I went to the Abbey for the evening service. I was the only one in the group to go but I felt called to be in the Abbey as much as possible. 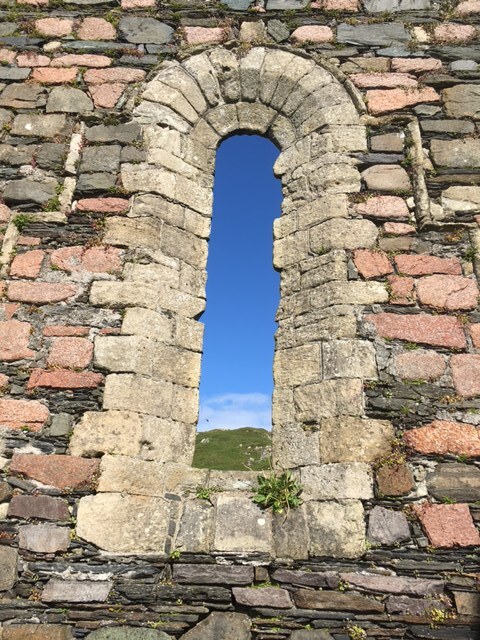 I was greeted by the shadow of the cross on the stone wall of St Columba’s tiny chapel and then made my way inside and found a seat in the Choir. The service was more traditional with just a handful of participants. That was fine with me because I love traditional liturgy. 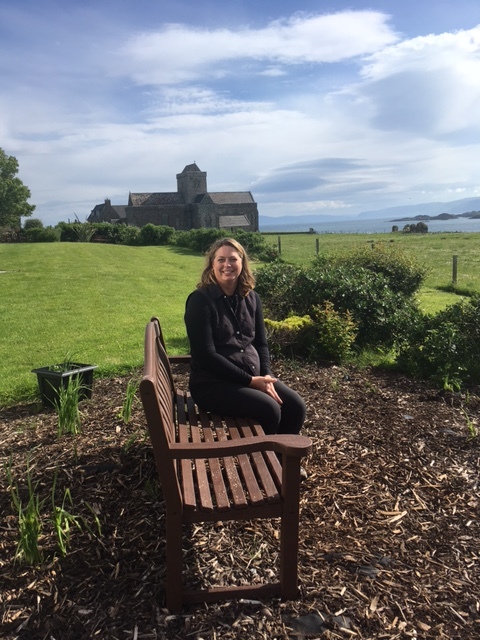 I know it was a time of devotion but the service was absolutely devised by the Divine for my perfect joyful day on Iona. First there was a cosmic joke—the young Englishman leading the service was wearing a bright green tee shirt that said “Dollywood Tennessee” I kid you not!! Dollywood is just up the road from my home and I have been there many times. The first song, one I knew well, reminded me of my dad. He was a very spiritual man and would have loved my pilgrimage. A few Bible readings and then another song. This time the hymn tune was St. Columba. Wait, that is my favorite tune—I’ve played it on the piano hundreds of times—I didn’t know that was the name. I play that song like a chant. There I was singing new words to my most loved hymn, St. Columba was already a part of my life. A few more Bible verses and then the closing song. The veil between heaven and earth was nonexistent as I sang the final tune as a two-part round “All praise to thee my God this Night for all the blessing for the Light”. I knew all the words by heart. “Praise God from whom all Blessing flow, Praise him all Creatures here below”. A perfect reminder of the message of devotion from the day before. My voice echoed against the ancient stones and I held my hand to my heart in pure joy. I joined my friends for our final coffee and dessert to share our experiences of the day as the sun set for the short night on this tiny island outpost in the north Atlantic. It was a magic day—not of big experiences but of subtle joys of our beautiful world, meaningful songs, sun and water, friends and history all bathed in the light of the Divine. The morning started early, around 5:30, when Nico brought us steaming mugs of coca tea. This not only warmed us up but woke us up, too. Coca tea tastes a lot like an herbal tea but definitely gets you going and helps with the altitude. Contacts in, yesterday’s clothes back on and a shuffle out of the tent and into my shoes and I was good to go, We all brought minimal stuff for the trail, a change of clothes, rain jacket, coat, hat and gloves, sleeping bag and walking poles—that was about it. What we didn’t carry went on the horse and that was limited to 12 pounds, everything else was stored at the Cusco hotel. We also met the family that lives in the home, mother, father Pablito, two sons and two daughters and two grandchildren. 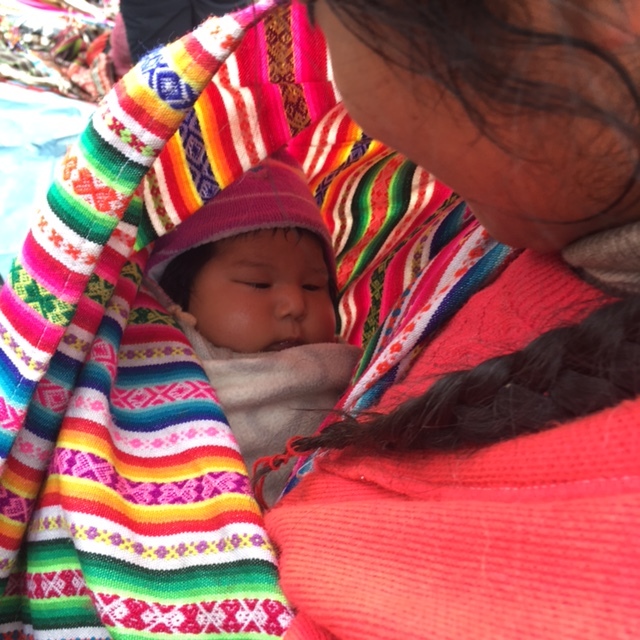 The youngest is just two months old—Daisy Karen—and we doted over that precious baby all wrapped up and ready to go on her mother’s back. We spoke the universal language of baby admiration—aaahhhhhhh!!!! 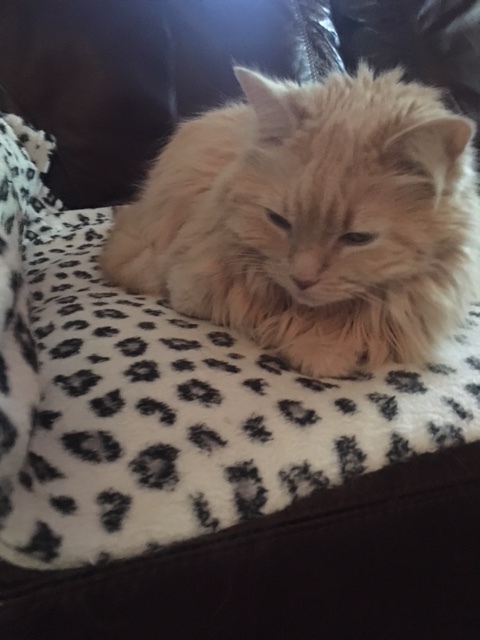 The little boy–Kevin– was not left out. He got treats and Alexandra picked him up and played with him. 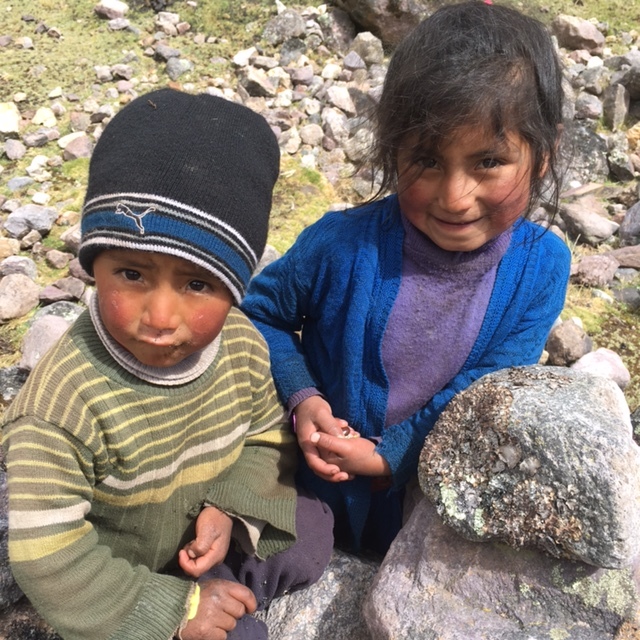 He informed her in quechua, “You are not my mother”. The ladies spread out Peruvian goods for us to purchase. 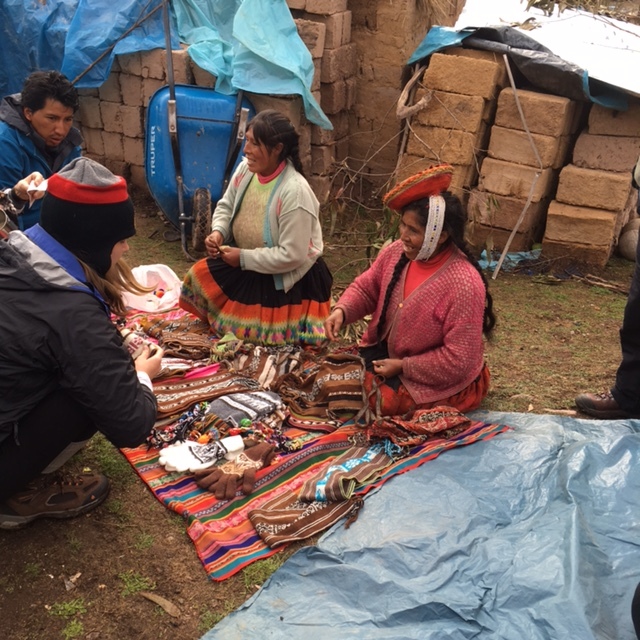 We were happy to buy socks, hats and beautiful hand woven bags to carry coca leaves. We so appreciated their hospitality and enjoyed the intimate look at their lives so different from ours. Yet, at our core, humans have the same needs, food, shelter and love. 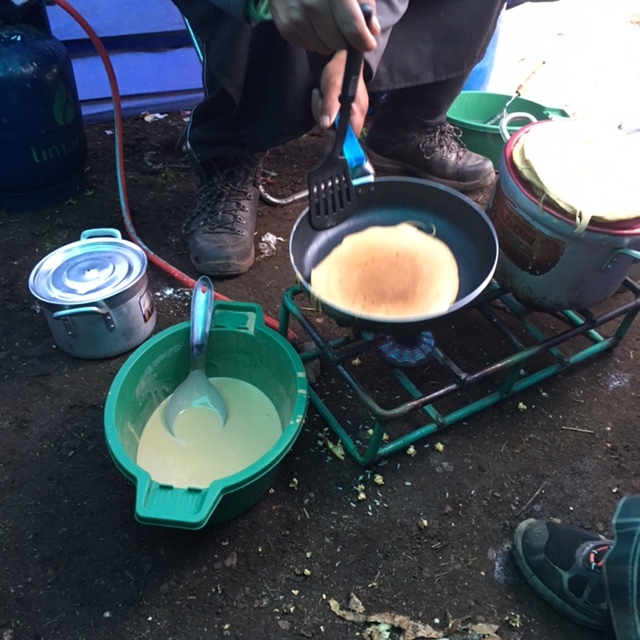 Nico cooked us a wonderful breakfast: first, quinoa porridge, then pancakes with strawberries, coffee and hot chocolate. All of our meals where cooked on his two burner stove on the ground connected to a propane tank. A few battered pots and pans, a knife and a cutting board on Nico’s lap completed the kitchen. It was amazing what he could cook for us, it was as delicious and complicated as any fine restaurant. So, everyone, no more excuses about lack of counter space or small stove. 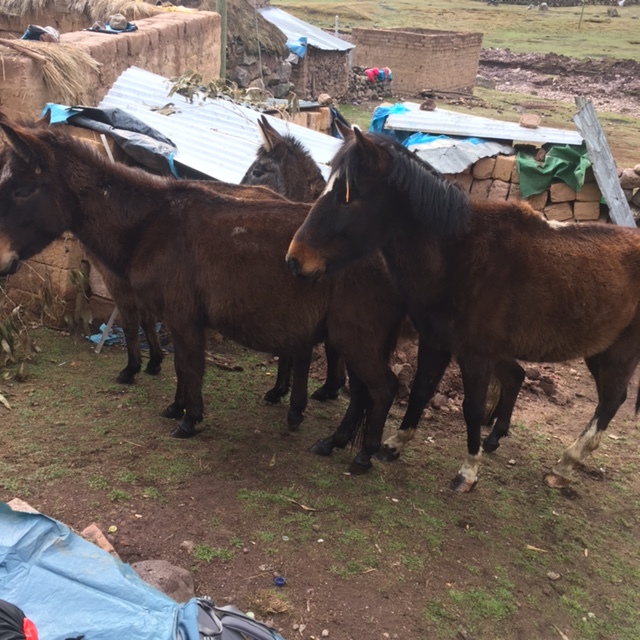 The horses were saddled with our tents and supplies. We said goodbye and started walking, first up a steep hill then on to flatter ground. 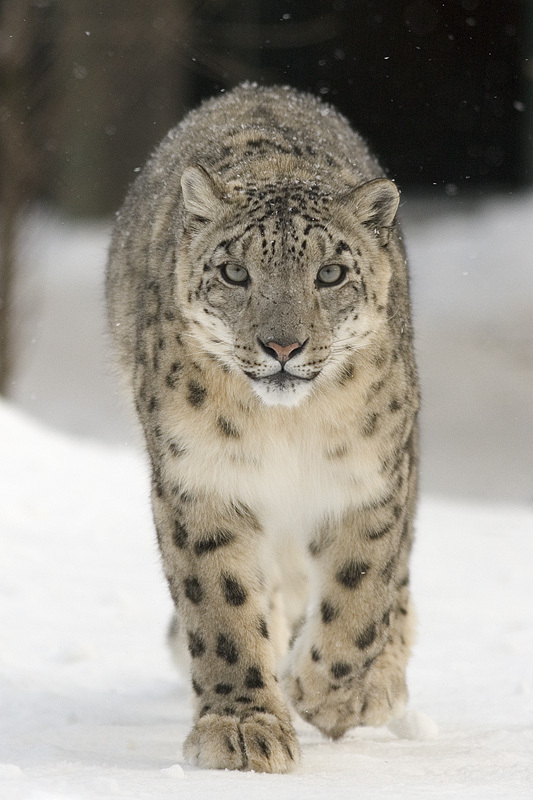 The barren land is beautiful and wild with high snow-capped mountains coming down to a gray-green valley. Well above the tree line we wouldn’t see a tree again until after lunch. There are no roads or power lines. The only signs of the inhabitants were low stone walls and an occasional thatched hut organically woven into the landscape. As we walked along children would appear beside the trail. I delighted in stopping and giving them treats. They were so gentle and beautiful. As quickly as they would appear they then would disappear back into the land to tend the sheep and alpacas. 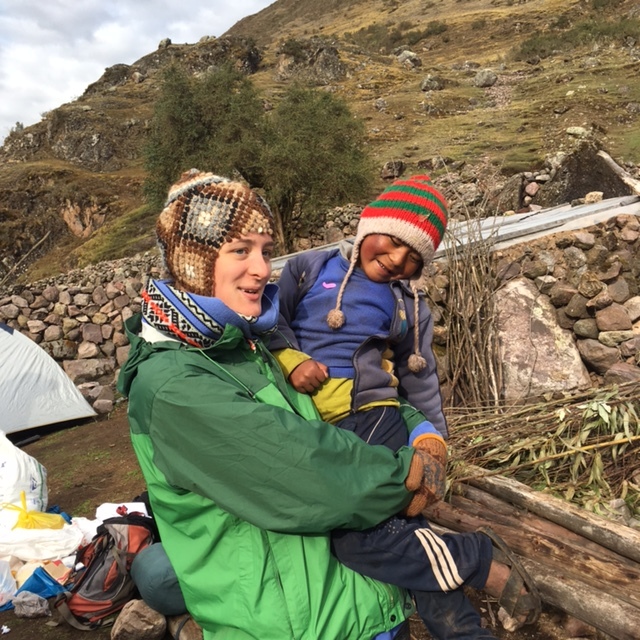 The trail started to get steeper and Melissa handed out coca leaves from her new bag. Normally my drug of choice is half-caf coffee with cream. Sometimes, I go wild and have a Starbucks tall latte but 14,000 feet called for something a bit stronger. Just a few coca leaves in the side of my mouth were just what I needed for the altitude. It is everything you would imagine about having leaves and twigs in your cheek; bitter, earthy and not very comfortable. But it does work, I never had a headache and I was expecting a raging headache. 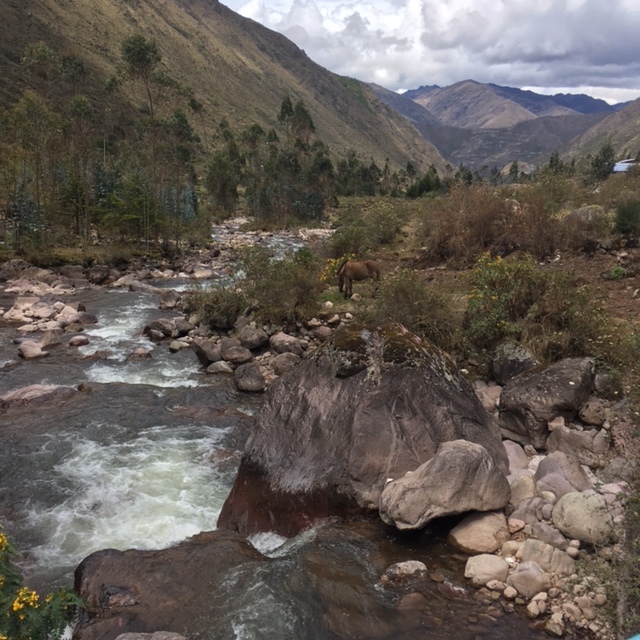 Coca leaves also help with thirst, hunger and nausea which is a good thing because breathing pretty much took up all the emotional and mental space. It rained some and then there was small hail. Melanie was struggling so one of the horses came back to get her up the mountain. The rest of us pushed on from one steep slope to the next. Eventually Lisa and I started to play the “rock game”. Choose a rock 15 feet ahead, slowly walk to it, stop and try to catch your breath. When you can almost breath again, choose another one, walk to it, stop and try to catch your breath. Three long steep slopes and we made it to the top, 15,000 feet! We were defiantly on top of the world and it was stunningly beautiful. Everywhere I looked was magnificent. Down below on the other side of the pass was a pristine mountain lake. After a very short stop to breath, take in the view, eat some cookies and enjoy our victory we headed down the mountain. It was very cold at the top and we still had a long ways to go. Breathing is defiantly easier going down but the new challenge was making sure I didn’t twist an ankle on the large shifting stones. I walked carefully, stopping often to look at the lake and just wonder at the rugged beauty: I couldn’t believe I was there. Past the lake was another stunning mountain lake and this beautiful fence in the shape of a heart. I was defiantly in the heart and arms of the Pachamama, the earth mother. This day was not about something humans had built like the Taj Mahal or Chartres Cathedral. 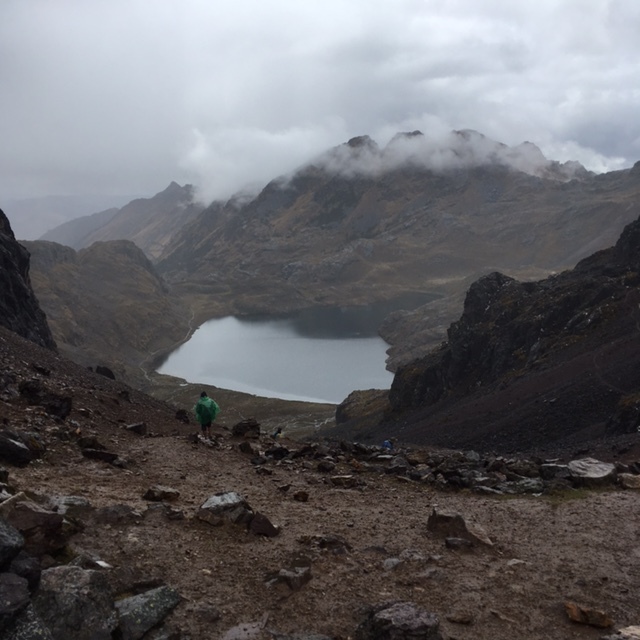 This was about walking with the Pachamama and the glories of our beautiful world. This was the special pilgrim moment I had come for, just this pristine, rugged beauty and the openness of my own heart. I had challenged myself to my physical limit which breaks down the barrier between the heart, mind and body. I had no choice but to become one with the Pachamama, the giver of life. I was on the road less traveled in the world and in my heart. The kitchen tent was already set up by a wide swiftly running stream. There Nico was working his magic and lunch would be served shortly. Richard and Pablito were following Nico’s orders running back and forth to the stream for water and washing the pots. 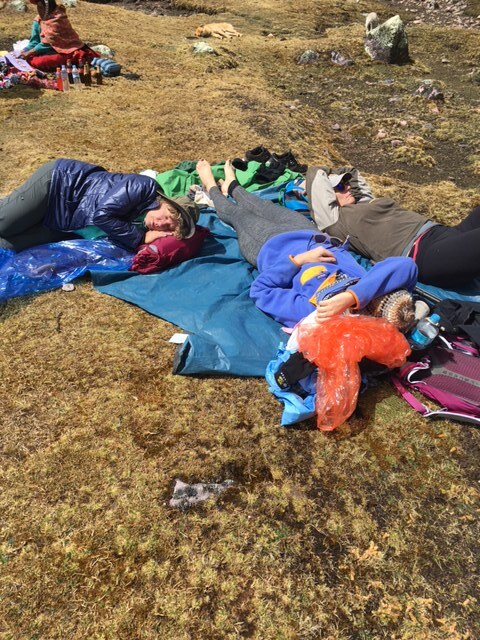 Most of us trekkers laid down on the tarp for a much needed rest except for me. If I got down I wasn’t sure I was getting back up so I sat on a camp stool by the water. Of course there was a lady selling treasures and so Alexandra bought some clean gloves and socks. The lady’s little girl was tending a lamb and quickly caught it so Alexandra could have an extended lamb fix. The lamb didn’t have a knit hat but Alexandra didn’t seem to care. She held that lamb until it totally objected. Alexandra is already planning her quarter-life crisis where she runs off to New Zealand and tends sheep for a year. After a lunch of soup, chicken and vegetables it was more down-hill walking to get to the campsite for the night. I continued to be slow so Richard held back with me to make sure I didn’t get lost. We were finally down to the tree-line in a very narrow valley with a roaring stream. I trudged along on the slippery rocks. My legs were already wobbly from the climb so I had to be careful. I eventually got a blister on the side of my foot from the uneven rocks. It was just getting dark when we arrived at camp. The tents were set up on a soccer field and the horses where munching on the grass nearby. The big excitement was a flush-toilet outhouse with tarp walls. Dinner was served in a rustic lodge next to the soccer field. There were tables and chairs and some drinks for sale thanks to the owners living next door. We bought three big bottles of water because we were very dehydrated and the stove was being used for cooking with no time to boil water. Nico cooked us a special farewell dinner for our last night. Each dish that was served had some fancy garnish made from vegetables, including little hard boiled egg mice and tomato flowers. 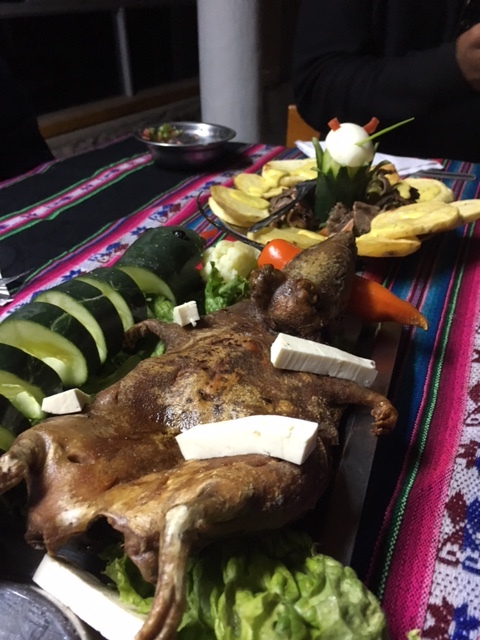 The final dish was a roast guinea pig splayed out with his feet dangling off the platter, complete with pepper in his mouth. I was hoping he wasn’t part of the choir from the night before, it was best if I didn’t know. Anne was brave and had several pieces and said it tasted a bit like duck. Melissa and Lisa tasted a bit too. The rest of us tried not to watch and focused on the pasta instead. Strange meat and snakes are somewhere long past my boundaries for adventure. I plan on tackling those challenges in another lifetime. Time to crawl into our sleeping bags. 15 miles, 15,000 feet altitude and roast guinea pig—it had been a long but completely fulfilling day. Every moment was challenging and thrilling all at the same time. 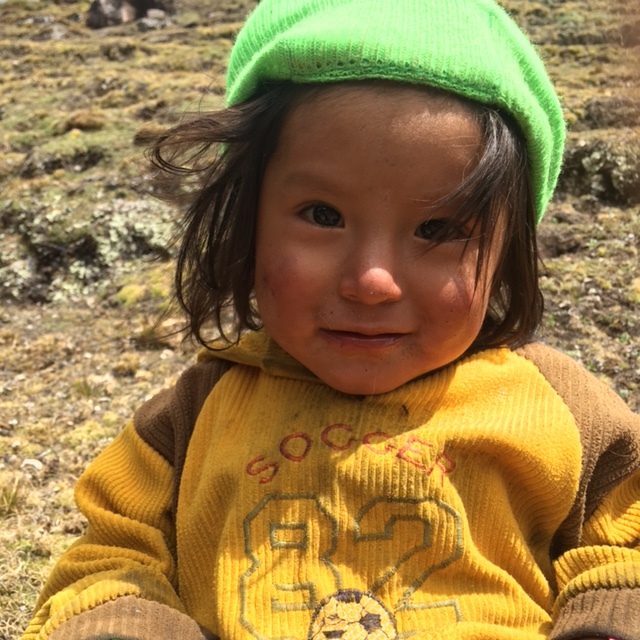 Our bodies were exhausted but our hearts and minds were filled with the love of the Pachamama. 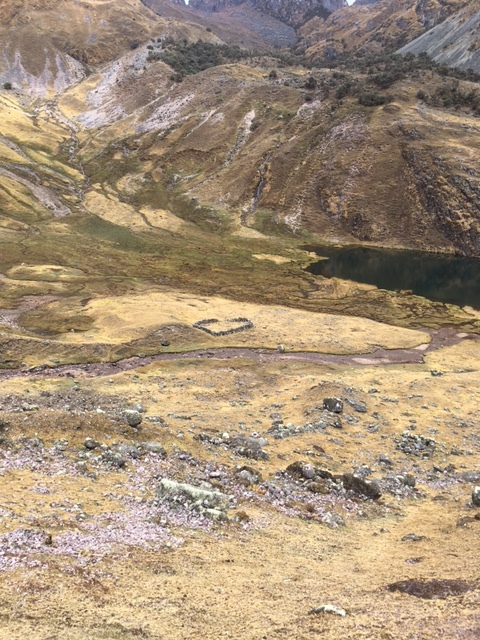 Originally we wanted to walk the Inca trail–26 miles from Ollantaytombo to Machu Picchu– but this trail has gotten very popular and is now limited to 500 permits a day which includes guides and porters. 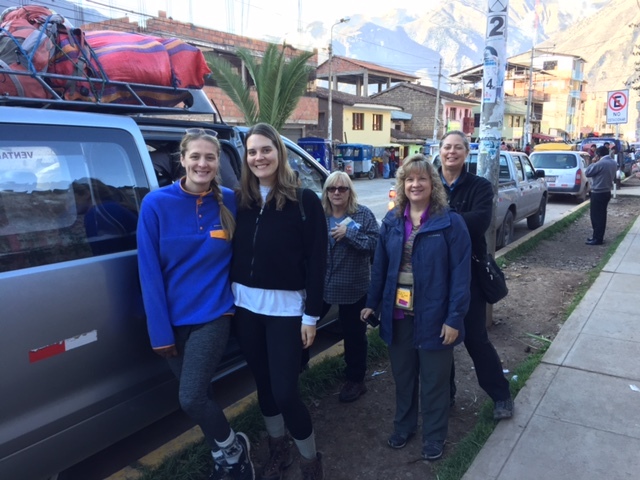 Some how our permits didn’t go through but the airline tickets were already purchased so we opted to do one of the other treks in the Sacred Valley that doesn’t require permits. Now all good pilgrims know that when things don’t work out as planned, you let it go and move to the next option and trust the process. I trusted the process and knew we would get the best experience for our needs. 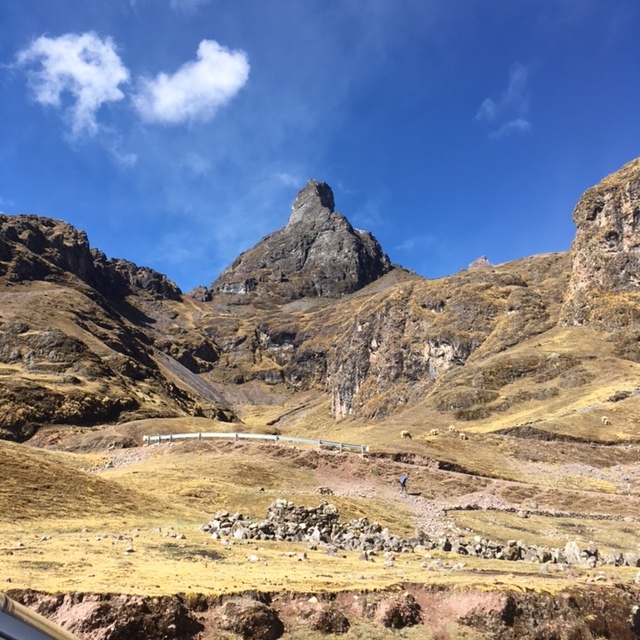 So, instead of a busy trail with thousands of Inca steps we ended up on the road less traveled. 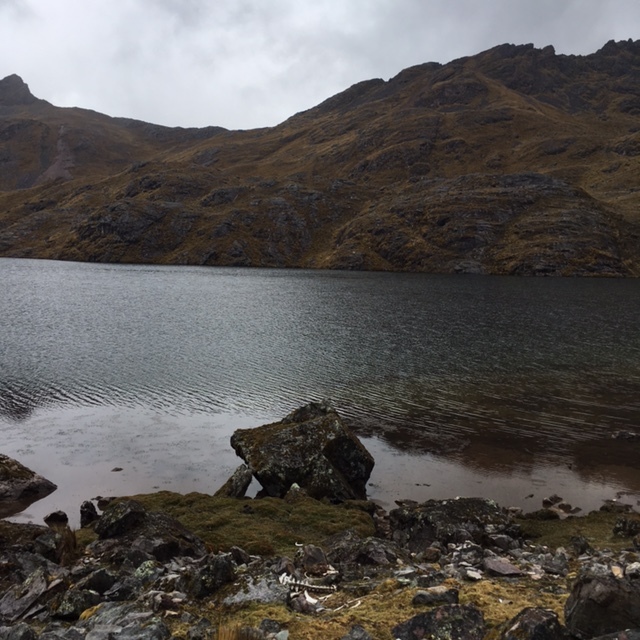 A total of 8 where on the Lares Trail the day we started instead of 500. We walked through the pristine countryside and tiny indigenous villages and saw lots of animals. 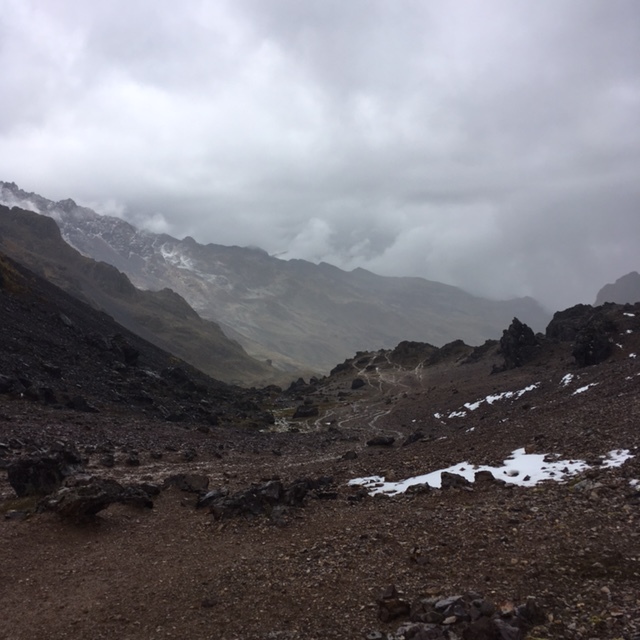 Although the trail was very challenging, it wasn’t quite as hard or as long as the Inca Trail or Salkantey Trail. 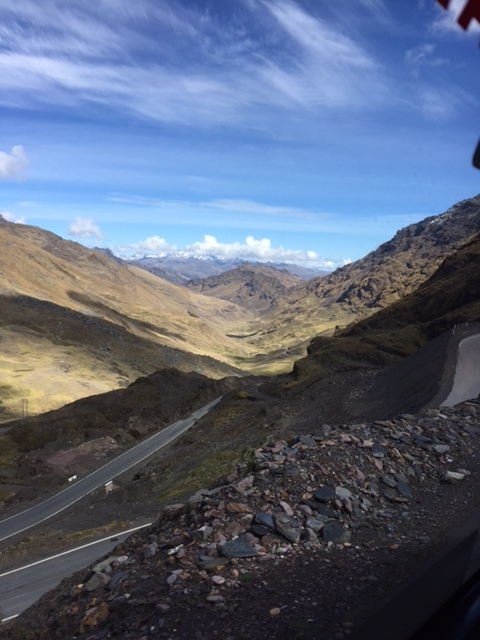 We all knew that we were where we were meant to be this beautiful October day in Peru. It was perfect. Our day started early when our guide Vladimir (www.karikuy.com) picked us up at 5:15 to head to our first stop in the Sacred Valley at Urubamba. We went to the market for breakfast where we found some delicious cake and then finally the coffee counter. The ladies made us hot chocolate and coffee with steaming milk and then fried eggs on the local flat bread. Below us we were the smells and sounds of the butcher cutting up that day’s meat. One of the local dogs managed to break in and help himself to the scrapes. We next drove up into the mountains on a narrow one-lane road with steep dropoffs on both sides. 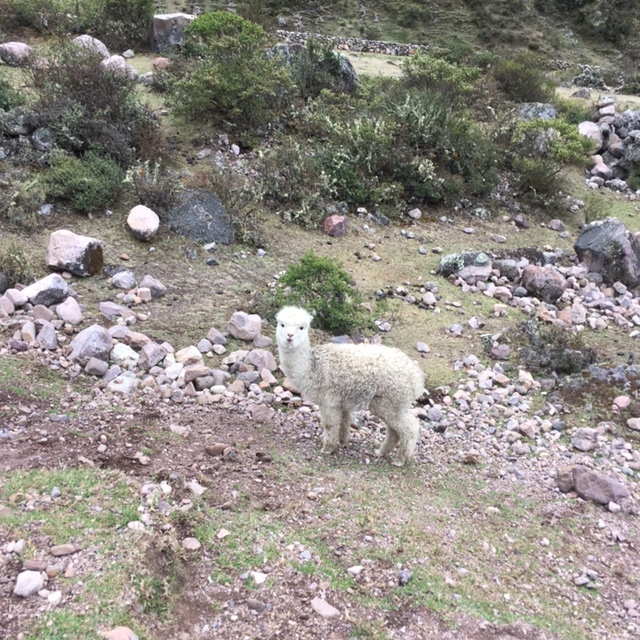 Fortunately, the driver negotiated it expertly and we focused in the scenery and the thousands of free-range alpacas grazing on the steep mountains. 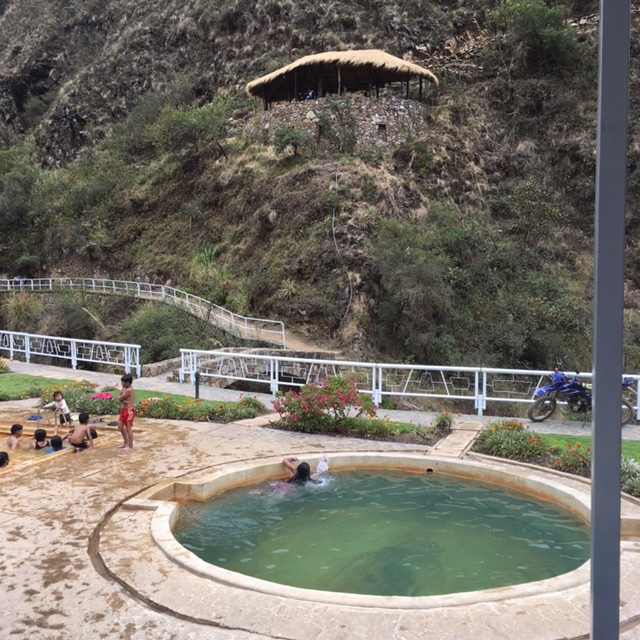 Our next stop was the hot spring at Lares, a beautiful garden with six pools ranging from cold to very hot. Lots of local children were playing in the shallower pool and took great delight in splashing the tall blond girl. Our guide showed us how to go from hot to cold and back to hot then to cold to have the complete spa experience. We dried off, put our hiking clothes back on, had a snack and headed up the mountain. We just had day packs with snacks, water and rain jacket. The rest of our gear was sent ahead by horse to our camping spot. The first part was steep and the altitude made me short of breath. I thought that maybe I had made a big mistake but I took my time and stopped for a rest and it soon leveled out next to a beautiful boulder-filled rushing stream. 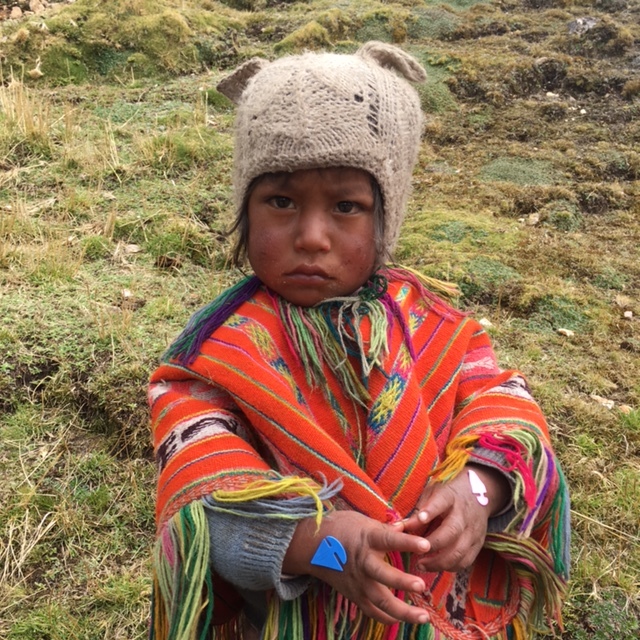 We stopped to thank Pachamama, the earth mother, goddess of fertility, for her gift of life and gave her an offering of three coca leaves. 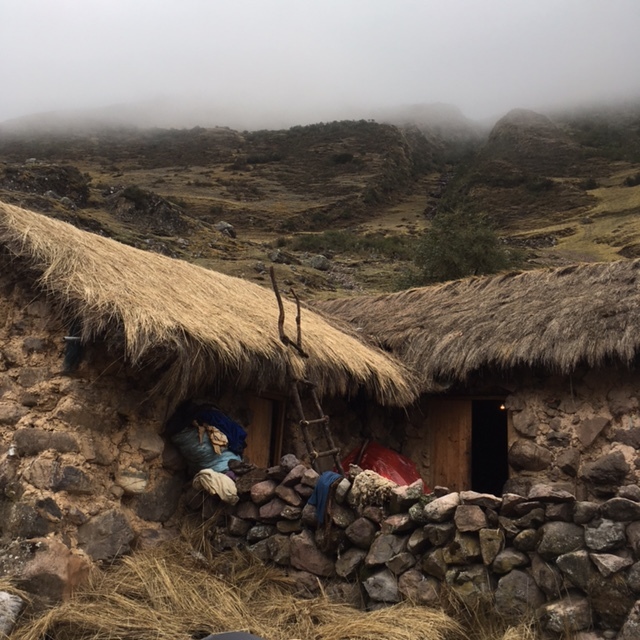 We walked by the small, stone houses of the local indigenous people, the Quechua. The little children would come running over to see us. My sister brought chocolates and I brought pens and puffy glitter stickers. I took the backing off the stickers and put them on their sweaters or in the backs of their hands. From toddlers to older children, they stood patiently waiting for me to get to each one. Big smiles and “gracias” and we were all happy. 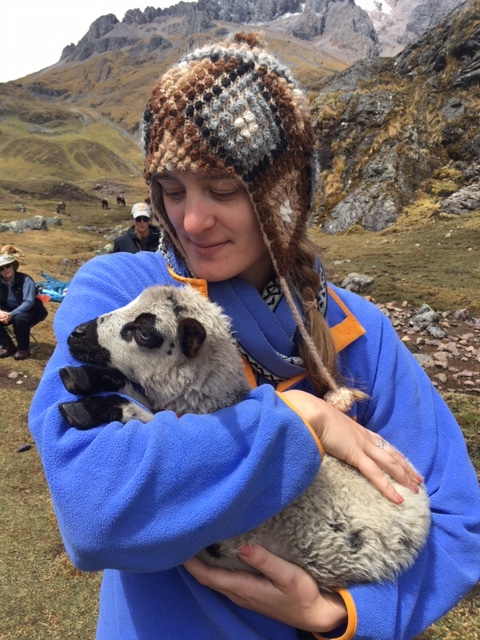 In the mean time, Alexandra made it her mission to personally great each of the ten thousand sheep and alpacas we saw and professing her undying love. Even the little pigs got the same attention. Meanwhile, Melanie documented every moment with pictures. We all had our rolls to play. 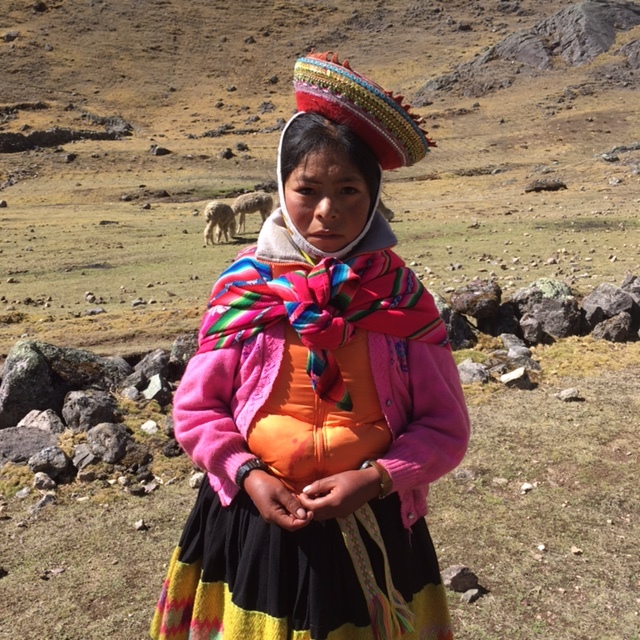 We slowly hiked up the mountainside enjoying each new view, animals and people in their colorful clothes. 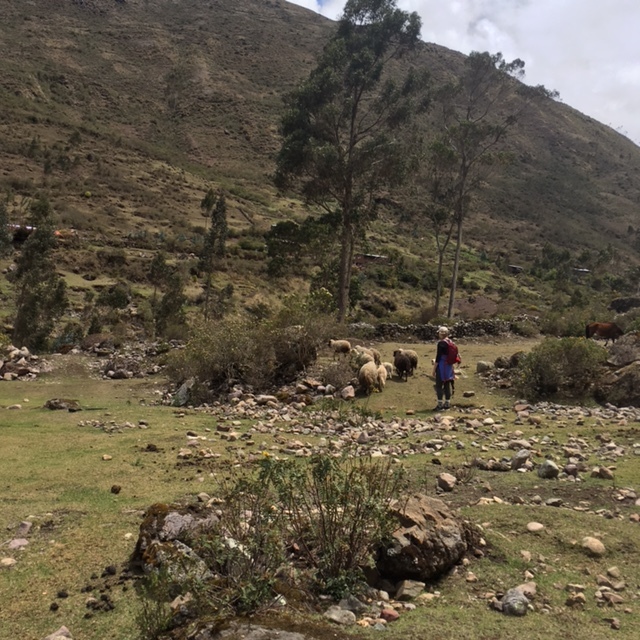 We hiked about four hours and six miles until we got to the little village where our tents were waiting for us in the barnyard by the small stone hut with thatched roof and dirt floors. This was the home of the horseman. Along with our guide Vladimir, there was the cook Nico, assistant Richard and horseman Pablito. Our guide said we were at 13,000 feet. We were all very tired and hungry and glad our lunch was almost ready. The hut was one room serving as kitchen, living room and store room. The sleeping room was a separate hut next to the main room. There was a table set up with a cloth and silverware and camp stools. First course was soup and it was delicious and perfect to warm us up. The next course was trout, potatoes, tomatoes and cucumbers and rice with hot sweet lemon tea. Alexandra noticed a couple of guinea pigs in the corner and, sure enough, after awhile about 30 guinea pigs where running around our feet as we ate. Their little chirping noises were like a choir singing to us, definitely a new experience for me. I fed the kitty some scrapes of trout and the guinea pigs liked the rice. I’m glad they weren’t on the menu. It would be hard to eat the entertainment. It was time to put on every layer we owned and hang out in the sleeping bags where we chatted and Melissa and Alexandra sang some of the songs from Hamilton. It gets very dark by 6 so we scouted a rock wall as an open air bathroom—Inca toilet– since the stand up outhouse seemed to be just a bit much. The lunch was so big and late that we asked for just a snack for supper. We snuggled into the cooking tent to eat popcorn, cookies and hot cocoa. 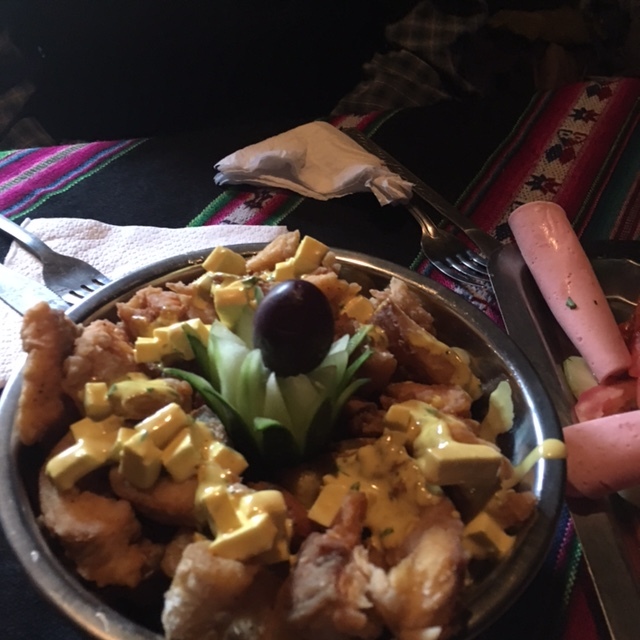 It was all delicious and really warmed us up for our night in our little tents in a barnyard with the little pig in Peru. The full moon cloaked in gentle clouds gave just enough light to make the land even more mysterious. 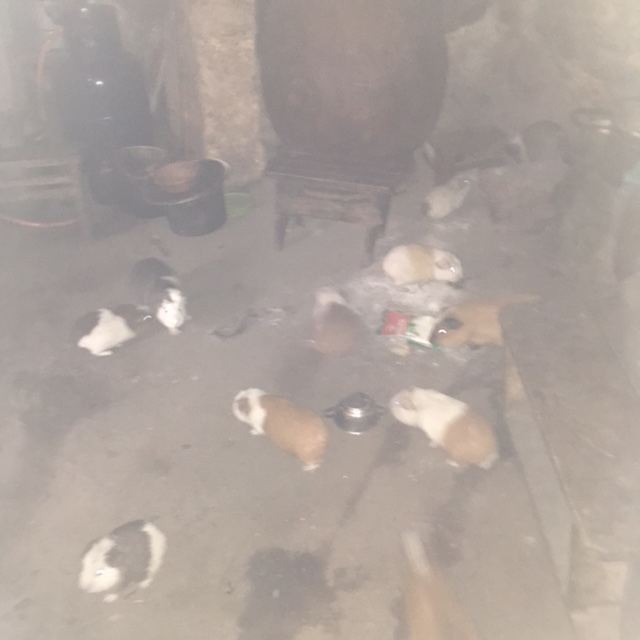 All of us are adventurous and good sports and find the whole experience delightful from guinea pig companions to stunning scenery. This is definitely not the trip for the fragile or neat freak but if you can find delight in living life to the fullest whatever that may be, it is the perfect adventure.